A manufacturing Company in Maharashtra facing Production Inefficiency was making losses for the last 2 years and its Growth was restricted as it had a 18% Fall in its turnover due to its Productivity, Efficiency and Capacity Utilisation issues. RenB scope included, creating a Production and Cost Efficiency Metric , and enabling cost efficiency in all areas by enabling the Best Production Practices and through a Process intervention to get cost efficiencies in Phase I and post this if there is satisfactory result then go for the Growth Strategy Program in Phase II. 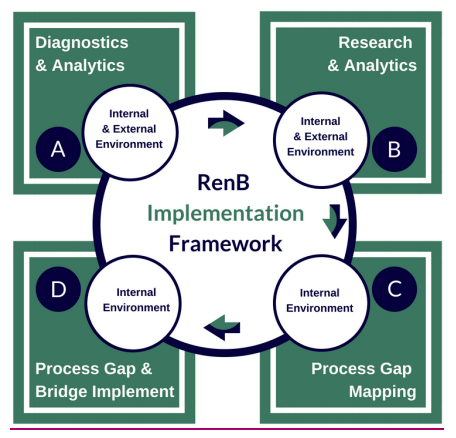 RenB started the Project a comprehensive Diagnostics Process using the RenB Diagnostic Framework to Understand the Lacunae in its current Production Practices. A Detailed Heat Map was generated which clearly defined the areas of Inefficiency productivity. The Diagnostic Process threw up the areas of inefficiencies, especially with major lacunae seen in production Practices and Production Floor Management , there were also inefficiencies seen the entire Production Processes which was manual from Raw material stage to Packing stage including Inventory and Logistics. Productivity issues due to production floor management. Quality Control SOP’s was defined for implementation based on TQM methodology. Checks and Balances in the Production Control areas with Production SOP’s. Productivity Measurements were defined and productivity Targets were assigned. Inventory best practices were implemented with Inventory control and visibility for decision support through an Inventory SOP. Raw material Purchase cost controls was implemented through a purchase process SOP being implemented. Production Supervisory methods were refined and implemented. Training the Production Staff on the SOPS was completed for implementation. Capacity Utilisation SOP with Visibility Metrics. From NO HRD Policy and Process to Implementing 62 Key Policy and Process for People Management and Development, adapting the RenB HRD 3T Framework, made an immediate impact with the employees and better productivity was seen in 60 days. The Company achieved a 38% Improvement in its Productivity and cost efficiency and savings accrued of 9%. The client has shown confidence in awarding the Phase 2 of its Growth Project to RenB, having satisfied with the Phase 1 of Productivity and Cost efficiency program of RenB .